The Reaction Research Society (RRS) held it’s monthly meeting on August 10, 2018 at the Ken Nakaoka Community Center. 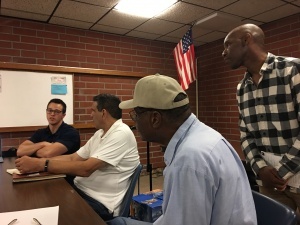 We were very well attended with four new people including returning member, Jim French. I was unable to attend the meeting, but other council members gave me their notes. This was to be a discussion of the 2018-07-21 launch event that the RRS held at the MTA with LAPD CSP and the student group at Watts. 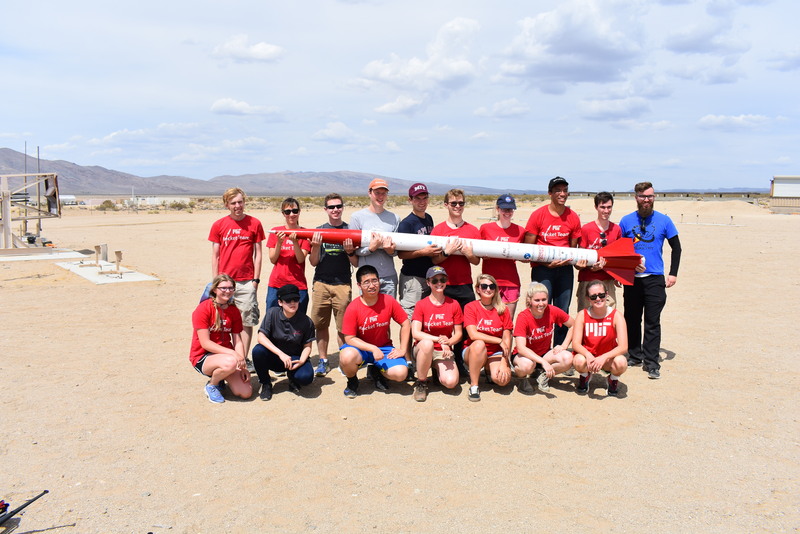 The event was successful with both the student alpha launches and a few RRS member alphas with payloads. The event was summarized in a previous article. A few things could have been done better which will make future events go more smoothly. [+] A single, simpler briefing to the kids would have been more effective. The kids in the student classes do pay attention at the events (which is great) but the RRS is giving a lot of redundant information and a more concise presentation delivered by only the pyro-op will be far better than having three people talking at the same time. [+] Also, every person conducting a launch or hot-firing at the MTA must submit a detailed proposal to the pyro-op for review at least a week in advance and gain the RRS and pyro-op’s approval PRIOR to coming to the event. The RRS used to be even more stringent on this requirement. The use of the RRS standard record form is required to be filled out by the experimenter for review by the pyro-op. The RRS requires advance preparation and there is no reason why this can not be done by all participants. In recent times, our pyro-ops have been very casual about this requirement and have been kind enough to review things on the spot, but this was always at the pyro-op’s discretion. The pyro-op is the single and solo authority for what is and isn’t done at the launch event. The pyro-op should be the most informed individual about what is going to be attempted at the MTA. The RRS has a Standard Record Form available on this website under the Membership tab of the Homepage and under the subheading of Forms. This downloadable document gives members a basic framework for the detailed information they must provide to the pyro-op describing their project and its goals. 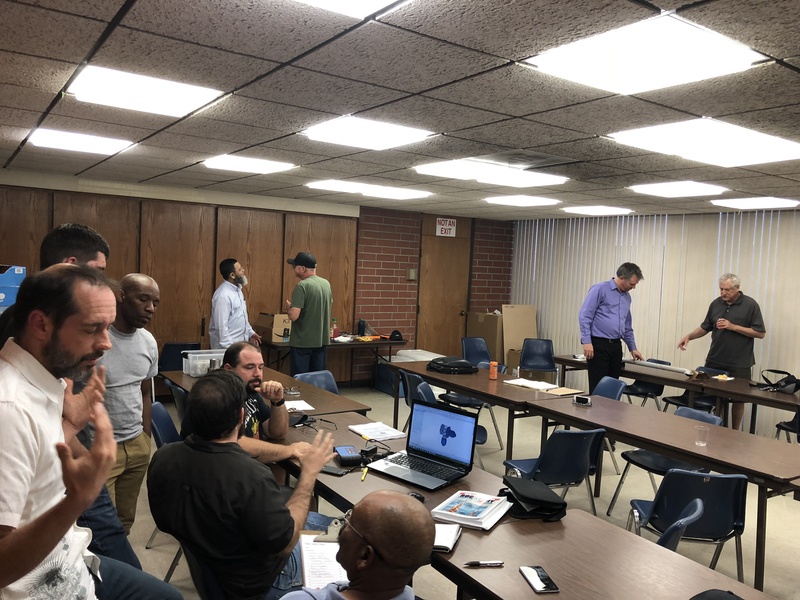 The RRS encourages members to present their proposed projects at the meetings and be very detailed in any reports submitted to the pyro-op and RRS president. The RRS wishes to keep good records to benefit the society and future projects. [+] In future events where we have the student launch event conducted first, we should not plan nor conduct any events before the student launch. 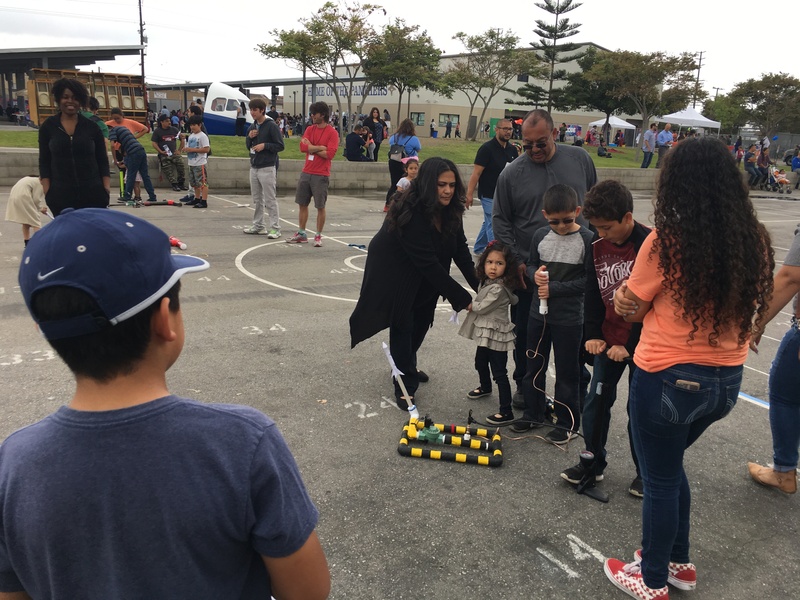 Getting back to an earlier point, having launch and hot-fire events declared, reviewed and scheduled days in advance will help make RRS events go more smoothly and safely. Years of experience at the MTA has shown that tasks ALWAYS take longer than planned and too much waiting can make coordination of large groups unnecessarily difficult. Therefore, having our coordinated events go off first without distractions from other planned activities will make it easier for our pyro-ops to conduct their duties and make our participants be more organized in their projects. 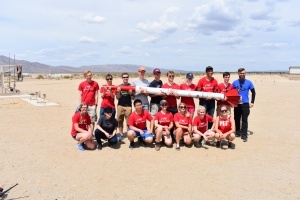 [+] The extreme heat of mid-July made it very difficult to conduct operations but having the motorized cart to shuttle the pyro-ops to and from the launch site made a critical difference. Bringing ice in the summer is a necessity. Having everyone well prepared for the hot weather continues to be the best advice. Chris Kobel who is a member of Rocketry Organization of California (ROC) shared some advice for pyrotechnic operators (pyro-op). Chris has been a pyro-op for over 10 years and is pretty active with amateur rocketry. Safety was the primary emphasis of his presentation. He also mentioned a key point of contact at the Office of the State Fire Marshall (OSFM) of California, Tom Campbell. Mr. Campbell is very important authority at the California State Fire Marshall’s office who can answer important questions. Chris and the other pyro-op members at ROC were also willing to counsel RRS members interested in becoming pyro-op’s. The RRS was glad to have Chris give our membership a wealth of information. We look forward to working more with Chris and ROC in the near future as the RRS is expanding our roster of pyro-ops for our growing events. 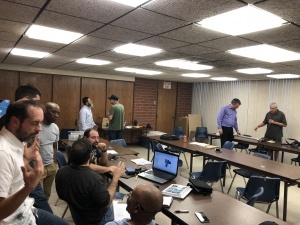 Osvaldo’s flight telemetry from his alpha flight on 2018-07-21 was briefly mentioned at the meeting. It was good that the flight was successful that data was taken. Given the time constraints, he’ll give more details at the next month’s meeting. Progress on the RRS alpha parachute systems and future attempts was to be detailed by both Osvaldo and Larry who each attempted a unique recovery system built into the small confines of the alpha payload tube. Again, insufficient time was available at this meeting and this event can move to next month. Sam Austin gave a presentation of MIT’s solid rocket launch and his upcoming liquid rocket hot-fire. 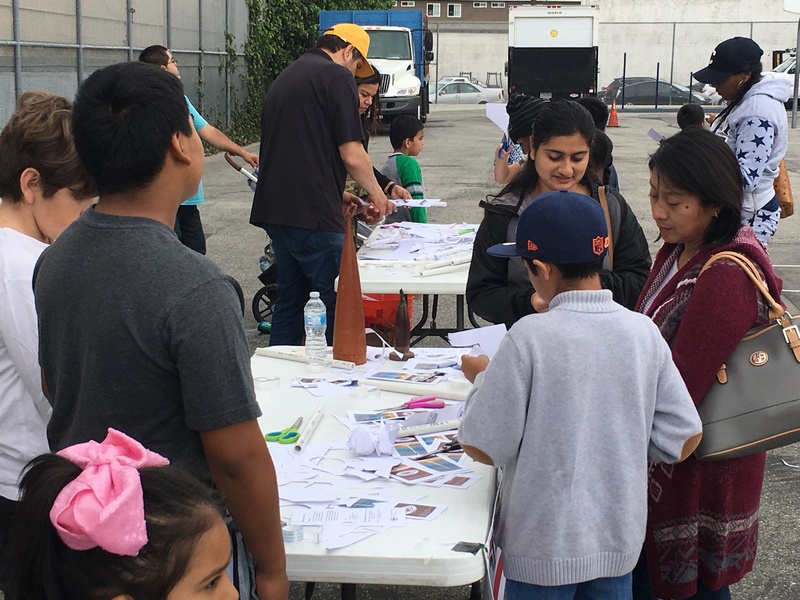 Sam is here in Los Angeles for the summer on his internship, but managed to find time to launch his rocket from the FAR site on the same day the RRS held our launch event on 2018-07-21. The MIT team’s custom-built solid rocket motor (O4000) made from scratch reached an altitude of 33,132 feet as confirmed by dual altimeters. The vehicle weighed 121 lbm at liftoff and reached a peak velocity of Mach 1.8. Sam described a rough order of operations for their solid rocket grain making process and detailed their recovery. 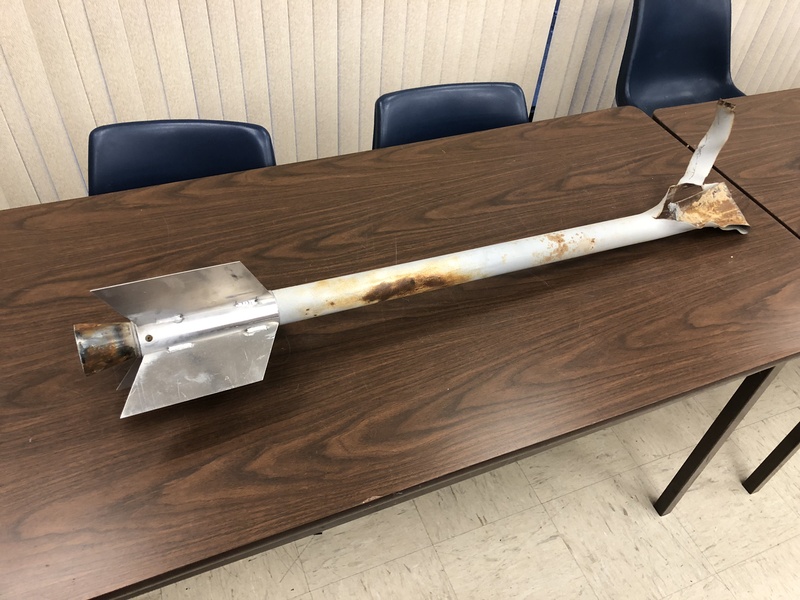 The rocket touched down safely 2 miles away and was fully recovered. The MIT team was elated and attributes their successful launch to careful design, many hours of testing that went into every component. 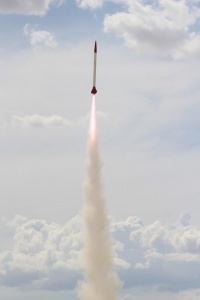 The RRS is happy for MIT’s success and hopes they will test at the MTA with their next rocket. 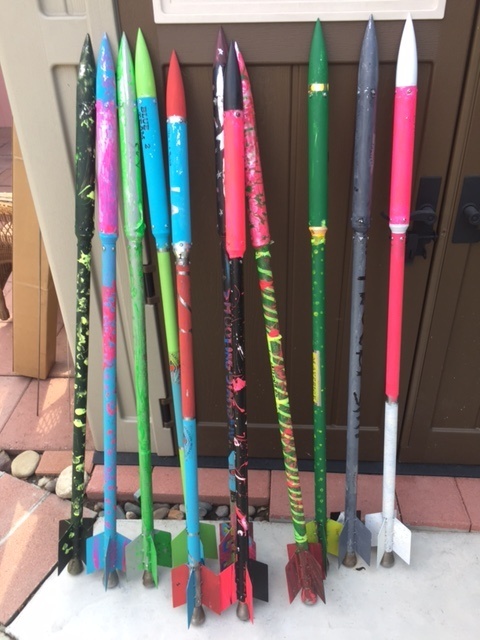 There will be a liquid rocket hot fire testing on August 18th at both the Friends of Amateur Rocketry (FAR) site and the RRS MTA. Sam Austin has been working on his liquid rocket motor to test at FAR, next door to the RRS MTA site. 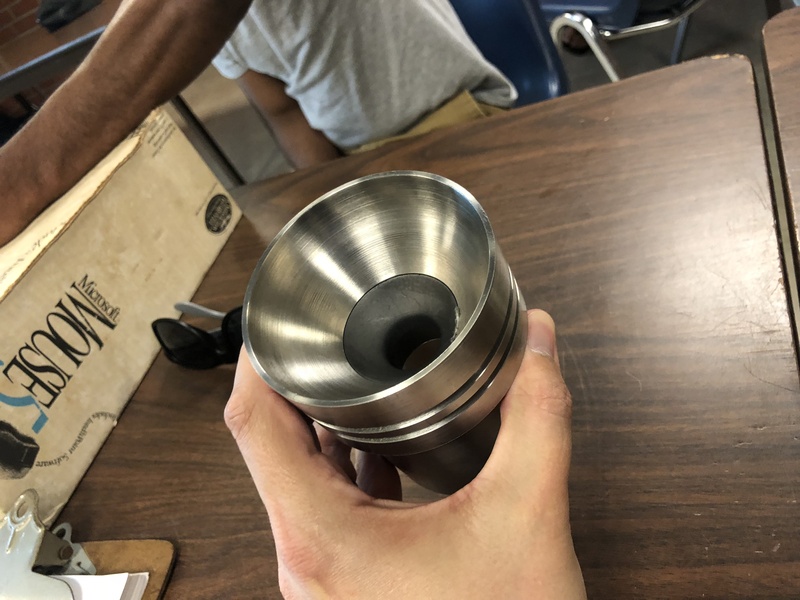 Richard Garcia has built a small liquid motor for what could become the RRS standard liquid rocket design. Our two members have agreed to share resources and the hot fire events will take place on 2018-08-18. Both projects will use a nitrogen K-bottle as their pressurization source and will share a liquid oxygen dewar to provide the oxidizer to both of their engines. Richard’s and Sam’s liquid rocket motors will use kerosene as a fuel. Richard’s design is a 1000-lbf thrust design with an assumed chamber pressure of 300 psig. Sam and Richard have put a lot of work into these projects and we hope they have success. I plan to go out there to help document the event for a new posting to come shortly after. The meeting was to discuss upcoming RRS launch events including the next one with LAPD. Frank has said that the next event with the LAPD CSP will be with the Boys and Girls Club. 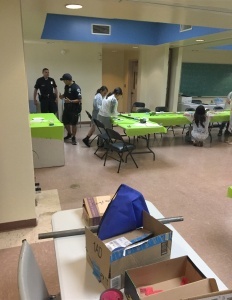 LAPD CSP is also working on setting up another school group in Watts for an RRS event. Specific dates were not yet set, but that information will be coming soon. We will post announcements of forthcoming launch events in the “Forum” section of this webpage. 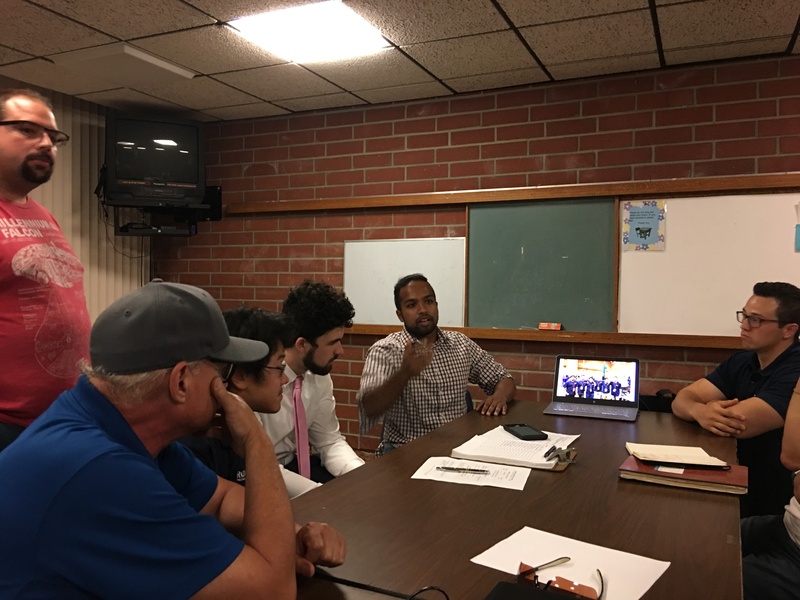 RRS Instagram and YouTube account guidelines have been generated by RRS treasurer, Chris Lujan, and are now being reviewed by the RRS executive council. The idea of creating an RRS media manager position was proposed and accepted by the council. 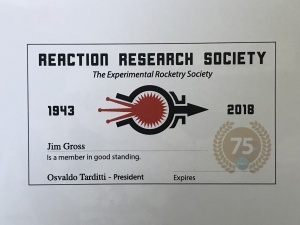 The RRS is considering offering this new position to RRS members, Bill Janczewski and Alastair Martin, who both have put forth a great deal of excellent work for the society. The RRS executive council will vote soon to better our social media presence to help our outreach efforts and give our followers a better view into the society. 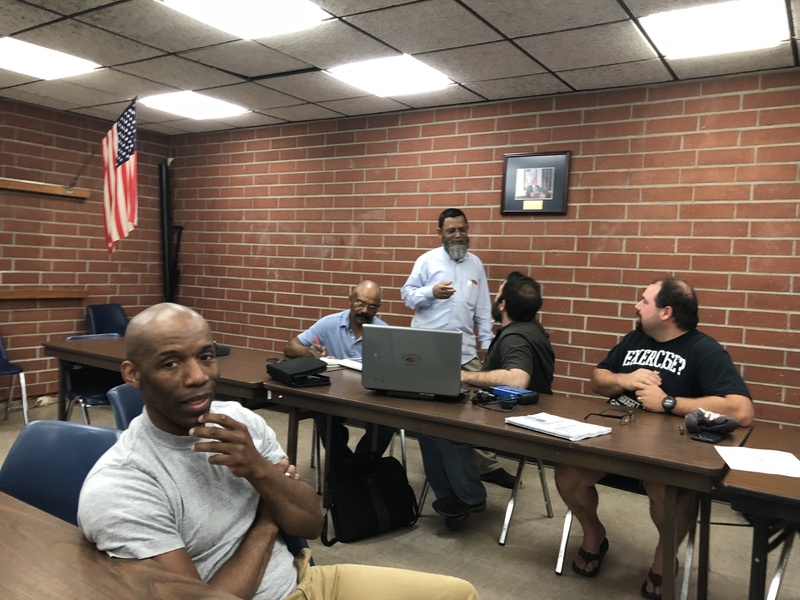 Richard Garcia shared access information with the executive council on the existing social media accounts that the RRS has including Facebook and YouTube. The RRS executive council now has access to Instagram and will be sharing photos from events more easily and quickly with our public audience. I have already begun to load photos I’ve had from recent events. More of the RRS will be posting to Instagram very soon. The RRS will start to hold special Saturday morning seminars for special topics that can be covered in more depth outside of our monthly meeting. These bi-monthly sessions will take some work to coordinate, but should allow more of our membership to enjoy the quality of talks that we have been privileged to enjoy. Jim French agreed to give the first of the RRS Saturday seminars at a date to be determined very soon. Jim was a member of the RRS 25 years ago and we’re happy he’s come back to join us. 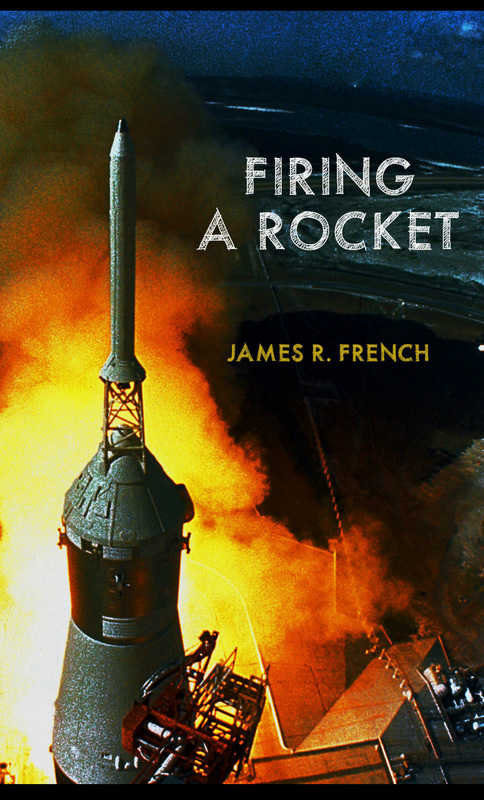 James R. “Jim” French also has the distinction of being a rocket engineer for over 60 years and worked at TRW on the Apollo program. 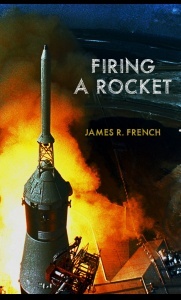 He wrote a book about his experiences called “Firing a Rocket”. This first RRS Saturday seminar will be a great presentation to start this series. The date will be announced soon. 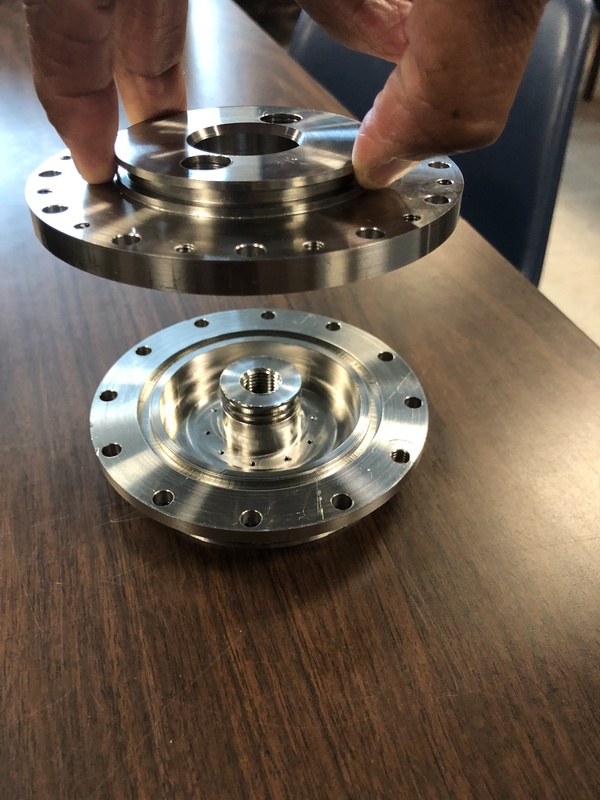 I have been able to get the top and bottom plates made for the RRS ballistic evaluation motor (BEM) which will be a key part of the SuperDosa project and the RRS having the ability to take accurate burn rate measurements at the MTA for future motors. I am thankful to Matt Moffitt of CNC Specialty Machining in Huntington Beach. 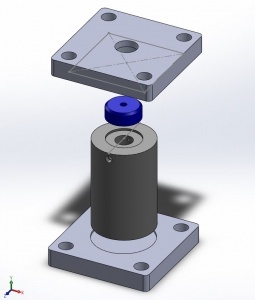 I hope to have the cylinder piece in the RRS BEM machined soon. This will likely require lathe work. 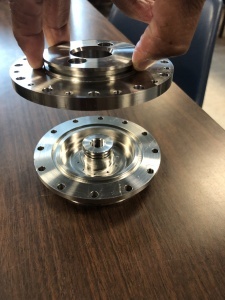 Osvaldo is also looking into getting this part made. It is my hope the RRS BEM can be completed by the next quarterly update of the SuperDosa project in October 2018. 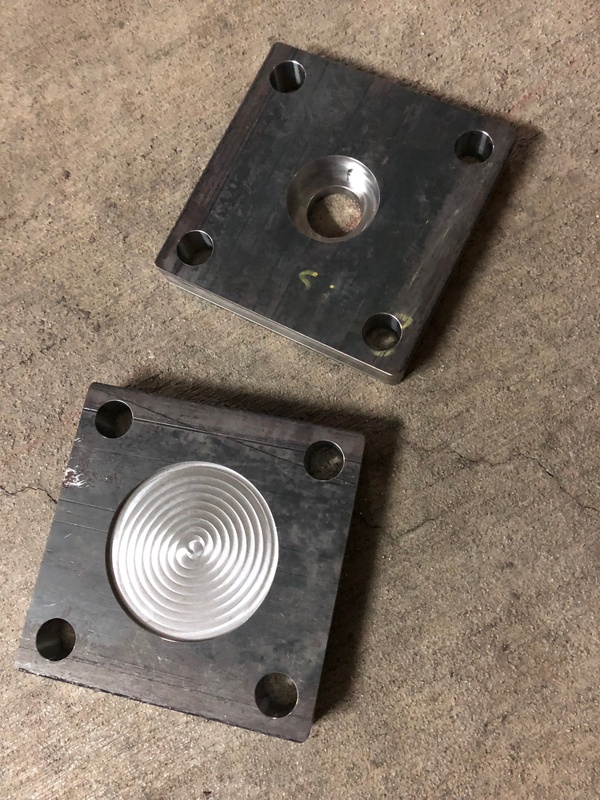 Top and bottom plates for the RRS BEM just back from the mill. I have heard that Jack Oswald is trying to get into testing his large solid motor with an improved design. The RRS may have more to present next month on this subject. 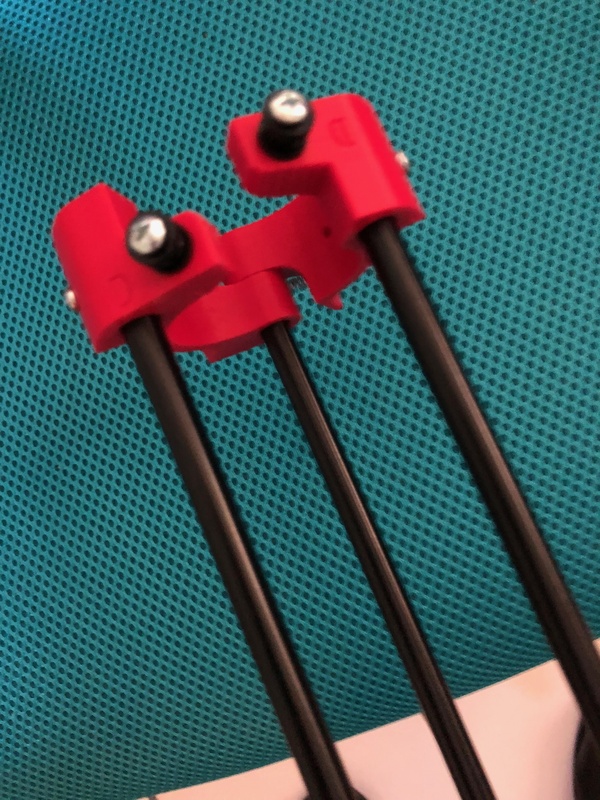 I wanted to bring a special device I bought from Additive Aerospace called a fly-away rail guide. I was introduced to this device by David Reese of ROC. Although the RRS has a very effective box-type rail launcher at the MTA site which will remain our standard technique, I decided to attempt a new method of launching an alpha just to get a longer guided path on launch. 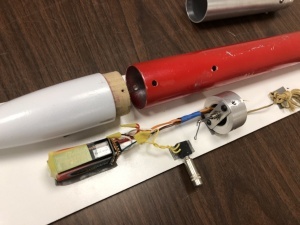 This device allows a rocket to be fired from a extruded aluminum rail launcher such as the one we have at the RRS MTA, but without having to permanently attach the round launch buttons to the rocket itself. A spring-loaded clampshell piece goes around the rocket with a launch button on either side such that the clamp is closed when the rocket is on the rail. As the rocket takes off, the fly-away rail guide goes with the rocket along the rail launcher until the buttons clear the rail and swing open releasing it from the rocket as it speeds away. Fly-away rail guide from Additive Aerospace; custom-built for an RRS standard alpha rocket, shown in the open position. 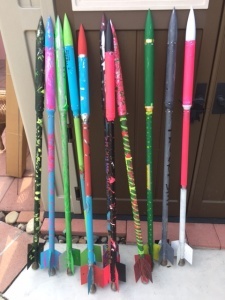 These devices are intended for common model rockets of the standard metric sizes (38mm, 54mm, 76mm, 98mm). 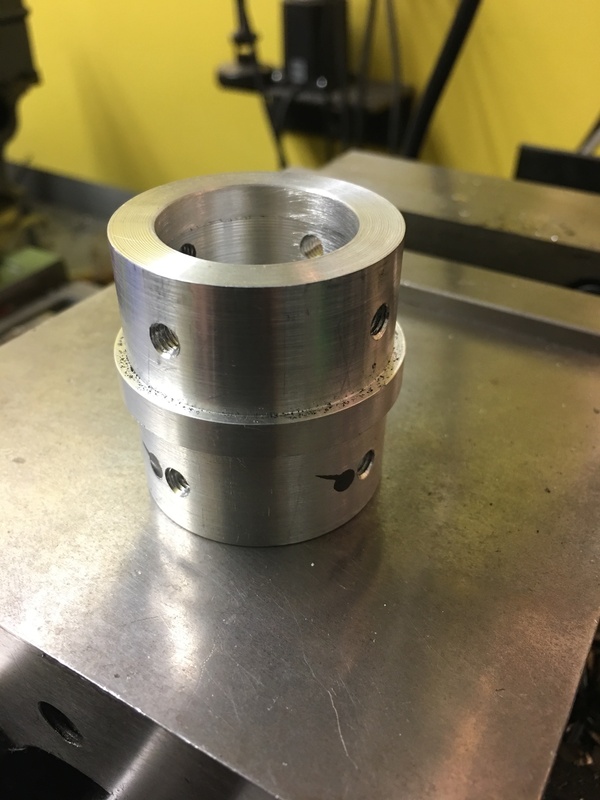 I had this rail guide customized to fit an RRS standard alpha rocket which is slightly smaller than the 38mm size at 1.25 inches in diameter. I hope to demonstrate the fly-away rail guide device with a loaded RRS alpha from the 12-foot rail launcher at the RRS at the next event. 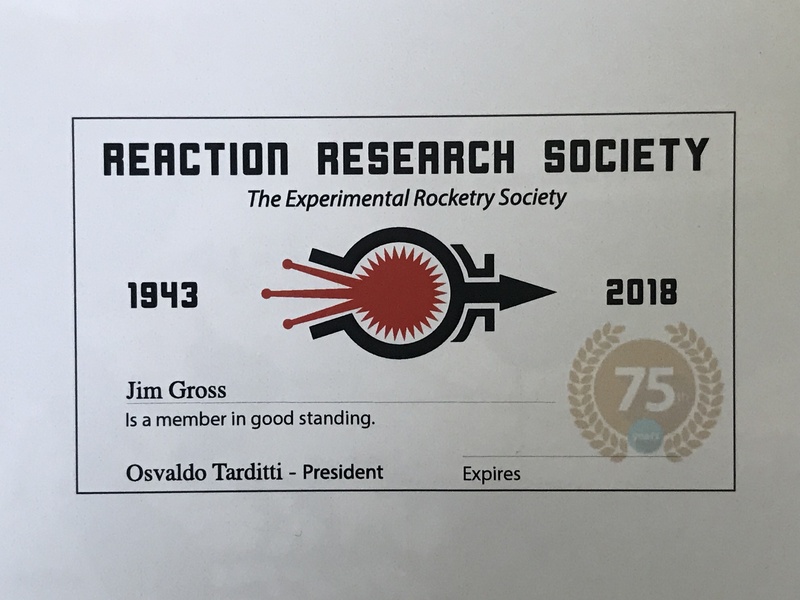 I will relay my findings to the society and back to Additive Aerospace who is very interested to see how their design can work with the RRS micrograin rockets. Meeting adjourned at 9:16pm which isn’t too bad. Our hosts at the Ken Nakaoka Community Center continue to graciously allow us to finish up despite the center’s closing at 9:00pm on Fridays. The RRS should seek to better finish on time as the staff at the center need to go home. The next meeting of the RRS will be held on September 14, 2018. For questions, contact the RRS treasurer, Chris Lujan.